Kandimallayapalle, popularly known as Bramham gari mutt is a hamlet of SOMIREDDYPALLE Situated at a distance of 23.5 miles from Mydukur and 38 miles from the nearest railway Station, Kadapa. Village is made up of the following communities: Hindus, Scheduled Castes, Scheduled Tribes and Muslims. The chief means of livelihood of the people are agriculture and agricultural labour. Sri veerabrahmamgari mutt is the place of worship in which the samadhi (tomb) of veerabrahmam is housed. There is a big compound which is partitiond by a wall running north-south.The mutt is on the western part of the compound with abig well and in the eastern portion,the samadhi of Eswaramma is housed in a temple. A vagu flows by the side of the northern wall of the compound. There is abuilding for the temple car on the other side of the road which runs on the south of the compoundwall. There is a poleramma temple on the outskirts of the village where the roads from Mudumala and Mallepalle meet within the mutt of veerabrahmam.There are samadhies of veerabrahmam’s wife,his son pothuluraiah and others around the main samadhi.There is a dhwajassthambham.There is a big house adjoining the samadhi towards the west inhabited by the successorsof veerabrahmam. Pedda peraiahgari mutt with his portrait and wooden sandals is the place of religious importance in kothapalle,another hamlet of somireddypalle. According to a Hindu belief veerabraham is an incarnation of lord vishnu. Bhoodevi (mother earth) went to Lord vishnu, apprised him of the immoral condition of the world, reminded Him of His promise that He would be born in each yuga to destroy the wicked and to protect the good and pprayed for rescuing the world from its fallen state. Lord vishnu conferred with Lord siva and Lord Bramha and convinced them that His proposed tenth avatharam (incarnation) as kaliki in kaliyuga was not enough to reform the world.He had to fight against a single Rakshasa (demon) only in His previous incarnation,whereas numberless individuals had turned worse than Rakshasas and the fight was against the vast multitude. Several preliminary incarnations were necessary to prepare the world for the final kalili avatharam. This time he needed the other two also to take birth in the world. Lord vishnu was born as veerabrahmam in the viswabrahmin family. Lord siva was born as ananda singh to vijaya singh,the ruler of Benares.when vijaya singh tried to get him married,it was predicted that he was destined not to marry.While hunting ananda singh killed a cow by mistake.To wash off the sin he became a sanyasi and undertook a pilgrimage for the darsan saints and sages.He met veerabrahmam at Harihar in Mysore state on the bank of tungabhadra. veerabrahmam revealed him that he was an incarnation of Lord siva and that he should beborn in a Muslim family for thevsin of having killed a cow.Ananda yogi returned home and resided till his death there only.Brahma was born as Annajayya to the viswabrahmin couple,Viswatmaka and Mayadevini of South India.Annajayya also became a sanyasi and met Veerabrahma at Banaganapalle.The Veerappaiah (Veerarahmam) revealed to him that he was vishnu ,annaayya was Brahma and Ananda singh of kasi was siva who had to take another birth in Muslim family.After Veerabrahmam joined Kandimallayapalle, Sri Mahalakshmi was born as Govindamma to Siva Kotaiah by tne grace of Mahalakshmi when the parents thought of her marriage,Govindamma told them that she had already made selection of her husband.Veerabrahmam went to Peddakomerla,the place of Siva Kotaiah,brought back to life the only son of the village Munciff (Reddy) and showed some other miracles and preached his Kalagnana. Lord Vishnu is said to have revealed his identity both to Govindamma and Siva Kotaiah and consequently Govindamma was given in marriage to Veerabrahmam.They begot three sons and a daughter .Led by Veerabrahmam,Ananda Singh and Annajayya reformed the society by their preachangs and warned them of the coming invasion of the country by Muslims who would force Hindus to embrace Islam.Superhuman powers were exhibited by them and especially Veerabrahmam won the devotion o the Hindus of the day. Sri Veerabrahmam is believed to have been born to the Viswabrahmin couple, Paripurnayacharyulu and Prakurthamba of Brahmandapuram, the location of which is not yet traced . But the boy lost the parents and finally came under the protection of Viswabrahmin couple, Veerabhojayacharyudu and Veerapapamamba.Veerabhojayacharyudu was the head of the Papaghni matt near the Nandi hills in Mysore state.When he was at Banaganapalle he became a servant in the house of Garimireddy Atchamma who employed him to look after her herd of cows.Garimireddy Atchamma when told by the villagers of the risk of her herd of cows being exposed to tigers, went in advance to the forest and hid herself behind a bush to watch the conduct of Veerabrahmam. Veerabrahmam let the herd on a grassy plot, drew a line enclosingthe herd, sat in a cave and engaged himself in writing kalagnanam inside that dark cave in the light emanating from his eyes.Atchamma fell upon his feet and got brahmopadesam. Veerabrahmam is also known as Veerappaiah and Veerambothaiah.He gave sight to the son of Atchamma who had been born blind.He converted mutton that was served to him in plates by the Nawab of Banaganapalle into sweets and fruits.He buried the Kalagnanam volumes underground and left to Kandimallayaplle. There he was treated as a madman and was even called Verri (insane) Veerabrahmam. Hoping for improvement in him they advised him to get married . He visited Hyderabad when the Nawab invited him. When veerabrahmam wanted oil to light the lamp for worship, the Nawab sent a pot full of water. Veerabrahmam placed mere wicks in the lamp and asked the Nawab himself to pour into the lamp the “oil” he had sent. The Nawab did so and when he lit the lamp,it burn brilliantly. He toured several places,showed very many miracles, converted several ,including the Nawab of Siddavat ,as his disciples and finally entered Samadhi on sundayi.e, vaisakha suddha Dasami (April-May) at mid day. Siddaiah, his chief disciple was not present at that time. After his return to Kandimallayapalle Siddaiah wept and prayed Veerabrahmam for his darsan. Veerabrahmam came out and talked to him. Later when Pothuluraiah, his own son, opened the Samadhi veerabrahmam cursed him to sped a period of 12 years in a forest doing penance for his fault. During the peddamma Jatara of Kandimallayapalle, it came to the turn of Veerabrahmam to prepare the wooden cart for the Gramadevatha. No cart was prepared upto the last moment. Veerabrahmam silenced the angry outbursts of the village headman under taking that it was his responsibility to see that the Gramadevatha would reach the outskirts of the village according to the previous practice. This time Gramadevatha did reach the outskirts of the village at the proper hour not drawn there in a cart but by the command of Veerabrahmam. It is no wonder that people began to believe him, his preachings, his kalagnanam, his warnings and guidance. A mutt was constructed by the devotees to Veerabrahmam. As predicted Ananda Singh or Anand Yogi was born as siddaiah to the Dedekula couple, Kadapa peeru Saheb and Adembi of Mudumala village. After spending his childhood at Mudumala he rushed to Veerabrahmam and became his disciple. Fuller details of Siddaiah’s life are given in Mudumala monograph.The purpose of incarnation of the Trimurties was achieved by showing the power of japam and yoga,by giving brahmopadesam (initiation) and explaining the secrets of the Universe. Society was warned of the imminent onslaughts against India and Hinduism. Sri Veerabrahmam is a great saint who is revered throughout the country and particularly in Rayalaseema for his preaching’s and his book kalagnanam which relates predictions of future happenings. In Kadapa and Kurnool districts the elder generation frequently speak of the several predictions of the great sage of Kandimallayapalle having come true though they sounded whimsical at that time. Nobody could believe that vehicles could move without harnessing animals,that lamps would burn not with oil but with water and that the state would be ruled from tents at Kurnool.All have come true. These are only a few. Eswaramma was the grand-daughter of Veerabrahmam and the daughter of Govindaiah. There was mutual love between her and Ranga Raju Who was born to Jaggaiah,a Zamindar of Nagiripadu in Rajampet taluk. Ranga Raju concluded by an inscription on a copper plate given to his father by Veerabrahmam that he was ordained to marry a girl of Veerabrahmam family. When Ranga Raju went all the way to Kandimallayapalle,Govindaiah ,father of Eswaramma, objected for an alliance as they belong to different castes. 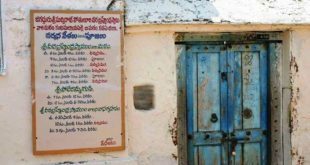 Pothuluraiah,the eldest son of Veerabrahmam and Ranga Raju went to Banaganapalle in Kurnool district to Garimireddy Atchamma’s house where the book was buried in an underground granary. They wanted to look into the kalagnanam, the voluminous book of Palmyra leaves Written by veerabrahmam in which several future happenings were predicted and recorded. But they could take only one volume. The other volumes changed into enraged poisonous cobras and hissed them away. According to the interpretation of Ranga Raju to one of the passages, he was ordained to enter in an agnigundam (fire pit) and Eswaramma to remain a maid to marry Ranga Raju in his next birth as Veeravasantharaya. Eswaramma remained a maid, developed yogic powers, showed several miracles, initiated several disciples into spiritual life,grew old and revealed that she would leave the body at midday on Margasia Bahula Navami (December-January).She got a samadhi prepared in the present locality, entered it at that exact hour and got its door closed and buried. During her life time she cursed her maternal uncle to become a leper as he attempted to outrage her modesty and immediately he became a leper. A group of magicians whose black magic against her proved ineffective admitted their folly and honoured her by arranging a good feast to Brahmins and Viswabrahmins. After serving the poor they found that ghee had not yet arrived. An awkward situation arose for the organizers. Then Eswaramma asked them to go to their village tank and bring two pots full of water telling to Ganga Devi that Eswaramma wanted loan of two pots full of ghee. Water actually turned into ghee, feast was over and when the supply of ghee arrived the loan of two pots full of ghee was returned to Ganga Devi (presiding deity of water), by pouring into the tank. In Rayalaseema particularly in Kadapa and Kurnool districts the devotees sing,in ecstasy,ballads about her life history ,preachings and the miracles She showed. Sri Veerabrahmamgari festival is celebrated twice annually, 3 days on each occasion from Vaisakha sudha Dasami (April-May) and Bahula Chaturdasi (February-March) respectively.The first festival is the Aradhana of Veerabrahmam in commemoration of the saint who entered jeevasamadhi on Vaisakha suddha Dasami. The second is held in connection with Mahasivaratri. 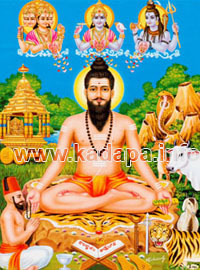 The usual fasting and jagaram (keeping awake throught out the night) is observed by devotees on Chaturdasi and a feast is theenjoyed on the following day. The celebrations conclude with the car festval on the 3rd day. Both the festivals are about 300 years old and widely known. The successors of Veerabrahmam are the patrons and pujaris who undertake the organization of the festivals by raising subscriptions and with the offerings made by the pilgrims in cash and jewellery. The festivals attract nearly 10.000 visitors belonging to all communities from all parts of the state. About half of them come from the neighbouring villages and daily return. The other visitors remain here till the last day. Prasadam distributed at the precincts of the dhwajasthambham is carefully dried, preserved, taken home hundreds of miles away by the visitors ,mixed with rice and distributed to all friends and relatives. Apart from the choultries available, pandals are erected and sanitary and water facilities are provided. It is said that Pedda Peeraiahgaru is the fourth son of Siddaiahgaru the first and foremost disciple of Veerabrahmamgaru. Quarrelling with his father,he left for the forest and did penance for 12 years in the Elumora cave and attained yogic powers.During his lie time he showed several miracles, the chief among them being,brining back to life a dried tamarind tree.He had several disciples and the popularly mentioned are kasa Narayanamma, kappala Nagamma, Boggula Akkamma and kumarai Murali. Pedda Peeraiah festival is celebrated for 2 days from Chaitra Suddha Padyami (March-April) in Kothapalle,hamlet of Somireddypalle. Naivedyam,cocoanuts,camphor,sandal paste and akshinthalu (rice mixed with turmeric) are offered. Animals are immolated in fulfillment of vows. The descendants of Pedda Peeraiah patronize the festival by collecting funds. About 1,000 to 2,000 devotees from the village and the neighbourhood congregate irrespective of caste and creed. People are fed free. Prasadam is distributed to all. A fair is held in this connection in an area of 1.75 Acres of the mutt. A few shops selling sweetmeats and other articles are opened. Devi Navarathrulu are celebrated in kothapalle for 10 days from Asviyuja Suddha Padyami to Navami (September-October). The deity is taken out in processiob on the last day viz., Navami. Akhanda deepamu is lit for the entire period of 9 days.Fruits,cocoanuts and camphor are offered to the deity. Devotees, local and from the neighbouring villages,congregate. Prasadam is distributed to all. Free feeding is arranged.